I have been so excited about the forthcoming release of this game for a number of reasons. I have been waiting for a game that my 3 year old can play easily on Kinect. It is billed as a co-operative game and I would love to find a game that my children won’t argue over. I am interested in evaluating its educational merit and whether or not it could be used in a pre-school classroom. So when I was offered a copy to review I jumped at the chance. 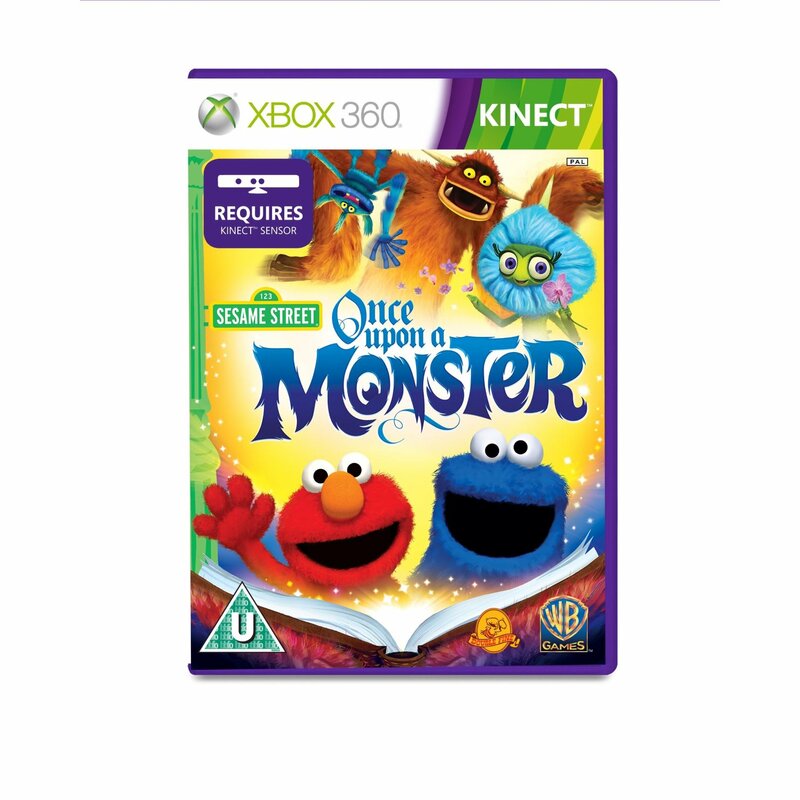 The game centres around a story book ‘ Once Upon a Monster’ that Elmo and Cookie Monster jump into to embark on adventures. As each chapter unfolds they encounter monster friends both new and familiar (Grover and Oscar) and help them to solve problems through a number of fun tasks. The graphics and the story behind the game are captivating and we were all excited to see what would happen next. The game is designed with drop in/ out co-operative play. It can be played solo or with the help of an adult or sibling, if you decide to join in half way through a small monster appears in the corner of the screen and directs you to wave. This is great for young children as they often decide to wander off in the middle of a game but it doesn’t spoil the game for the other child. The game is only suitable for 2 children which means that it probably wouldn’t be suitable for use in pre-school unless you wanted to use it as an exercise in turn taking. I would like to see it adapted for 3 children, partly because I have 3 children and it would avoid one being left out and partly so that siblings could play with a parent to help if necessary. With Kinect games I have found that my 3 year old has struggled to keep within the sensor. There is a helpful built in feature with this game in that if the child steps outside of the sensors limits a monster pops up and points in the direction that they need to move. I had high hopes for this game as a controllorless game that my 3 year old would be able to use easily. However I encountered a few problems which meant that she couldn’t play it independently. To get inside the page of a book the monsters ask you to bring both arms together. This worked really well when my 7 year old or myself did it but it didn’t seem to work for my 3 year old or her friend, even though they were making the correct movements. The other problem is that if you go too close to the sensor (or my one year old runs in the way) a menu pops up . You need to wave on the back button to go back to the game. My girls became frustrated because the sensor found it difficult to pick up which player was trying to direct it. So far we have played the first of 6 chapters. This centres on cheering up Marco the monster and helping him get to a birthday party. The tasks along the way include running through the woods collecting objects and avoiding obstacles, flying to the tree tops to collect fruit with Grover, choosing outfits for Seamus the monster, drumming and my personal favourite disco dancing with Grover. The usual response from my 7 year old when playing Kinect is to moan at her younger sister for getting in the way. When she tried to join in yesterday my 7 year old complained and I told her that it was meant to be for 2 players. The mood soon changed to a lovely picture as my 3 year old watched her sister intently and copied her every move. It is certainly fulfilling some of the games aim to foster a social and emotional curriculum in our household. There could be a few tweaks to make it easier for young children to play but the game is engaging and fun and my high expectations were not disappointed. I’m really looking forward to seeing what the other chapters have in store.